Intended use: Conditioning/tempo runs, distance running. The fourth version of the Kinvara gets minor upgrades, like the re-worked Flexfilm upper and use of Powergrid in the heel. 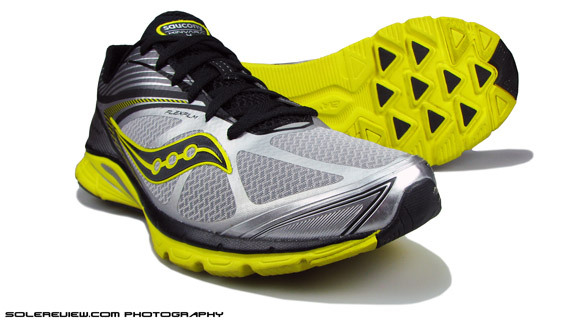 Rest of the shoe is 90% the same as the Kinvara 3, so it rides, feels and fits the same except for the tighter forefoot. 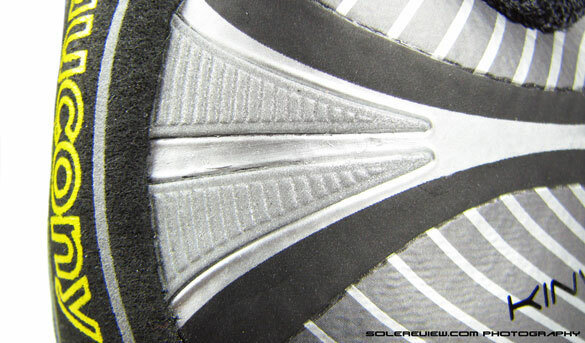 Outsole durability continues to remain a problem area. It didn’t take us many miles of running to realize that the Kinvara 4 hasn’t changed at all. Compared to Kinvara 3, we meant. Sure, there are a few nips and tucks, but if you look past that, then it is practically the same shoe in body and soul. Which might be a good thing or bad, depending on how you looked at it. Good if you liked the Kinvara 3 and didn’t want it to change. Like your cute three year old nephew who you never want to see grow up. Bad, if you wanted a fully reconstructed-redesigned-reborn Kinvara, because the fourth version isn’t that. So there. If you came here to read how different the new version of the Kinvara is from the old one, let me tell you in plain-speak – there is almost no difference at all except for the forefoot room, and you’d fare jolly well to stick to the K3’s. Unless, you’ve worn your outsole flat, and you want a new pair. But that said, if this Kinvara 4 happens to be your first Kinvara, and you’d like to know more, then stick around to read the review, which, for all practical purposes, is a re-hashed version of the K3 review. Can’t help it really, when the new Kinvara shows up to a meeting in the same suit it wore yesterday, except for a new tie and shiny cuff links. This was expected though, given the footwear industry’s average update cadence. Which happens to be- update the whole shoe one year, come back the next year with a facelift, and then redo the shoe in year three. Most of the second year updates happens on the upper and the sole unit generally remains untouched. For good reason too. Sole updates are a pricey affair, with new molds running a bill of hundreds of thousands of dollars. Things might change with the 3D printing technology evolving and all that jazz, but for now, we think all of us have to live with the 1-3, 1-3 update calendar. The other legitimate reason is that it takes more than a few months to get customer feedback on a particular model which could be used in the next model update. Developmental lead times are huge too. For example, Kinvara 3 released in Summer 2012, but by November or December 2012, the Saucony team would have already started work on the Kinvara 5, given the minimum of a 18 month development calendar. So any major change in the Kinvara 4 would have been a foregone conclusion, considering the shoe would have already been past prototype stage by the time Kinvara 3 was launched. This is how the industry usually works, and there’s little you or me can do about it unless technology speeds up the process and at the same time, lowers the costs. The Kinvara 3 had a major revamp from the previous version, the highlight of which was a redesigned sole unit and use of ‘Flexfilm’ upper material, which was this urethane layer welded on the upper fabric without seams. The Kinvara 4 carries over these in its redesigned upper, and it is a good thing because there was a lot to like in the K3. The Kinvara 4 has an updated layer of Flexfilm used in the Kinvara 3, and the new pattern allows for more mesh area to be visible. Air circulation was already good in the K3, so there is not much improvement. 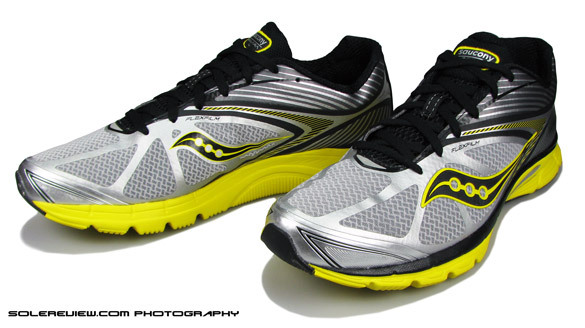 However, there are two things the new Flexfilm design does better than the Kinvara 3. The first being the placement of the welded Flexfilm, which goes from a left to right pattern to a linear pattern. The Kinvara 3’s multiple layers of Flexfilm running sideways on the toe box led to a mild ‘dig’ into the foot, which, while not uncomfortable, was noticeable during low speeds. 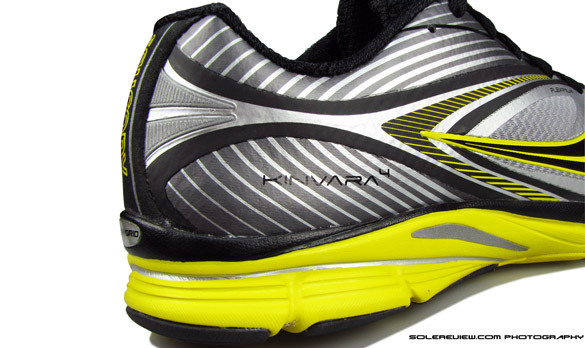 The Kinvara 4 rectifies that by switching to a overlay ‘box’ design, which reduces the material in the front area, resulting in a better flexing behavior. The sensation of the Flexfilm bending inwards is now gone, and aesthetically, the forefoot area looks much cleaner now. But there is a trade-off; the forefoot feels much more tighter especially on the sides of the first and fifth meta-tarsal (big toe and small toe). A narrower forefoot without changing the last is a no-no in our books, so overall the re-design of the Flexfilm isn’t without its faults. This is reminiscent of our Brooks Ghost 4 review, in which we pointed out the effects of forefoot redesign on fit. The Kinvara uses two types of fused overlays – the thin Flexfilm and the regular urethane overlay, which is thicker. The Flexfilm is used in the front for better flexibility, fit and ventilation, while the fused TPU dominates the heel area, giving the shoe support in that area. 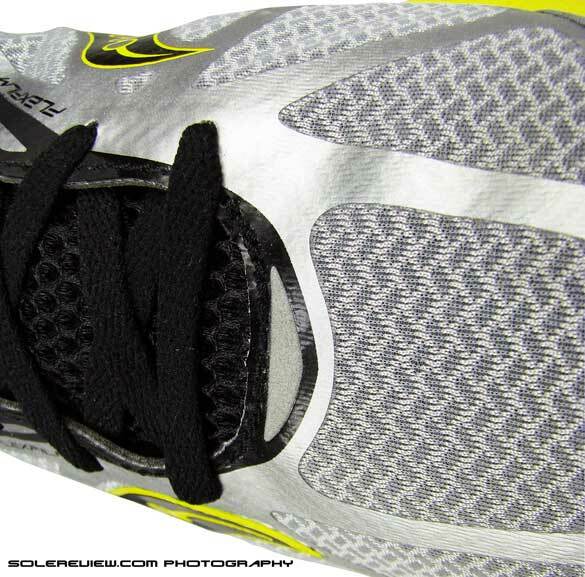 The Flexfilm in the Kinvara 3 covered the upper right till the heel, which made the shoe upper extremely flexible. 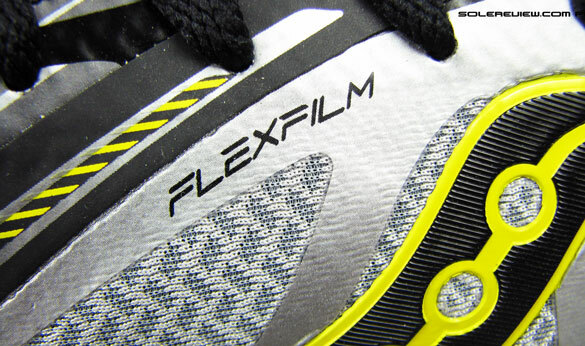 The Kinvara 4’s use of Flexfilm is far less liberal; the material extends till the mid foot and slightly beyond, and rest of the overlay is regular, non-Flexfilm type. Which is not a bad thing, because it gives the shoe better form without sacrificing flexibility. Because of the lack of support in the upper, the outer side of the Kinvara 3 upper had a tendency to lean inwards when lying around unused. The Kinvara 4 fares much better that way; more use of the thicker overlays give the upper more support, resulting in improved form even when the shoe is sitting there doing nothing. There is always a give and take, and in this case it happens to be the shoe weight. The weight of the Kinvara 4 goes up by 3 grams, and while that is insignificant, it just goes to show that even the smallest change has an impact on weight. The triangular, reflective insert on the forefoot on the Kinvara 4 stays in place, and the shiny bits on the heel transform from a two triangle set-up to a four piece reflective one, flaring outwards from centre of heel. 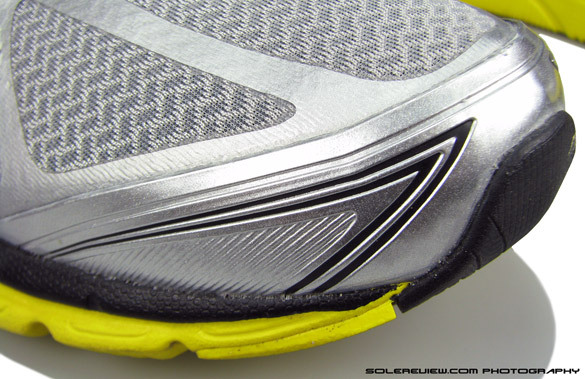 The reflective area remains unchanged, but the reworked heel reflectivity certainly looks more appealing. The texture of the toe bumper on the Kinvara 4 has changed, but it does away with the night time reflective piece seen in the Kinvara 3. Not good. Inside the upper, there’s only one change. The upper tongue mesh is now a simple, two layer spacer mesh, which to our eyes appears less premium than the one used before, but from a performance standpoint there is no difference. As a matter of fact, the Kinvara 4 tongue mesh has a better ‘squeeze’, and while it might well be a figment of our imagination, we felt that the lacing top down pressure was alleviated owing to the new tongue mesh. 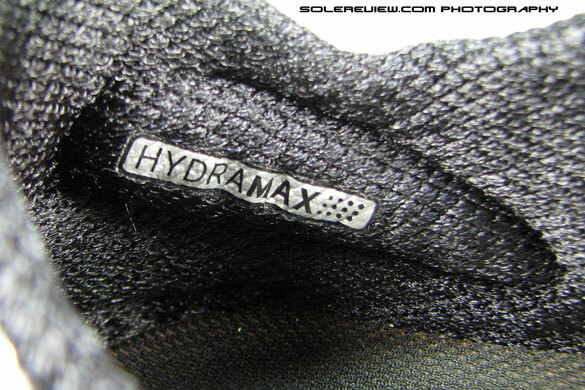 Everything else inside the upper is exactly the same as Kinvara 3, right from the tongue and upper lining, the ‘Hydramax’ collar lining and memory foam pods (which perform fabulously, by the way) and the sockliner. Speaking of which, the insole has been a huge let down. Coming off our long term wear test experience of the Kinvara 3, we found out the sockliner foam flattens out after 40-50 miles or so, and it loses most of its bounce. 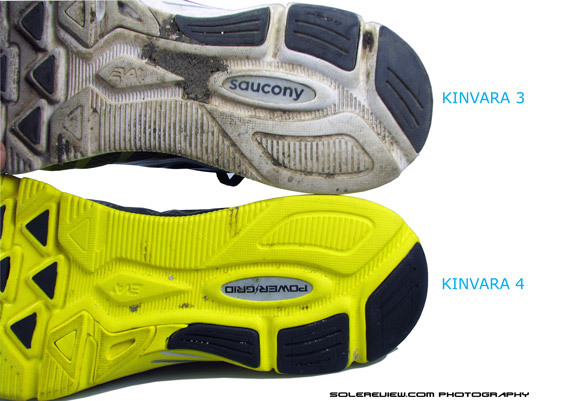 The Kinvara 4 insole is made out of the same foam, so we expect it to meet a similar fate after a few 10k races. We certainly hope this area has been looked at (and rectified) in the K5. The sole unit is a paradox, as it was in the Kinvara 3. Cushy in the heel, and stiff in the forefoot. For heel strikers, the rear foot section will take you by surprise with its level of cushioning. 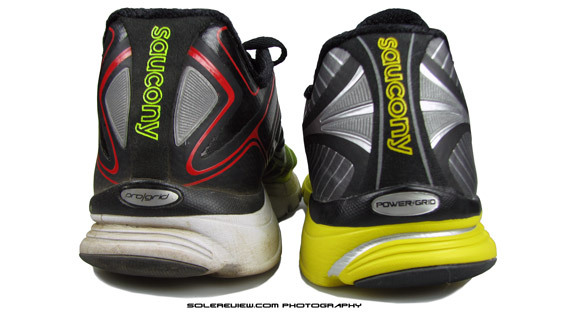 Saucony uses a ‘Grid’ (sort of an internal trampoline) system in the heel and end result of combining that with the midsole foam is a comfortable ride, which sits somewhere between firm and soft, and feels just right. A plastic insert in the heel area of the sole announces the use of ‘Powergrid’ (it was ‘Progrid’ in the Kinvara 3) in the midsole, though we were hard pressed to tell the difference. The K3 felt good in the heel, and the Kinvara 4 does too. The forefoot is stiff as it has been in the last version, and runners looking for greater forefoot flexibility will be disappointed. Runners looking to do speed work will be happy though; the stiffer forefoot is conducive to quick touch and go, akin to a racing flat. Cosmetically, the midsole looks sharper with the inclusion of silver paint in the ridge which visually separates the upper area of the midsole and the heel crash pad. Complements the reflective midsole insert in a good way, too. Outsole durability has been a challenge in the Kinvara 3, more so in the forefoot area than anywhere else. The small triangular pieces of rubber wear out their thread very quickly; so much so that even after a mere 20k on asphalt, there will be visible signs of damage. 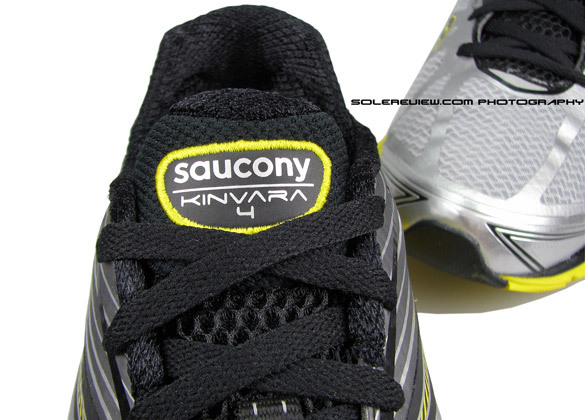 The Kinvara 4 has the exact same outsole, and hence similar outcomes on durability. 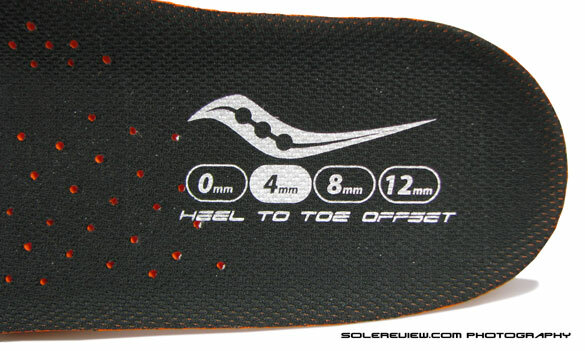 The rest of the sole unit, be it the heel area or under the arch, scores adequately on long term durability. We know that the Kinvara 5 (May 1st release) has some improvements aimed at increasing the outsole life, but can’t say to what extent – unless we test the new design. Given the flat, all point contact outsole surface, the Kinvara 4 handles well whether you’re sprinting into track corners or speeding on narrow lane curves. The shoe is extremely lightweight at 238 gms /8.4 Oz (US 11) so you’ll be running feather footed steps minus the sensation of bulk wrapped around your foot. With the low drop (4mm) and low heel height (22 mm for US9) the Kinvara 4 delivers a confidence inspiring heel to toe transition, with universal compatibility for rear, mid and forefoot strikers. 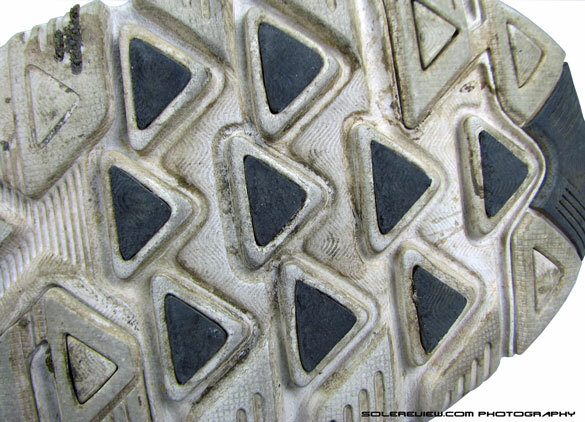 The thickness of the midsole absorbs any bumps one might encounter on the road without the disadvantage of a footsink. If all of these things sound and feel familiar with Kinvara 3 in the background, it is because the Kinvara 4 is a near identical twin of its former self. Go for the Kinvara 4 if you’ve loved the version 3.0 but wanted another brand new Kinvara with a different paint job. We assure you, it will not disappoint.